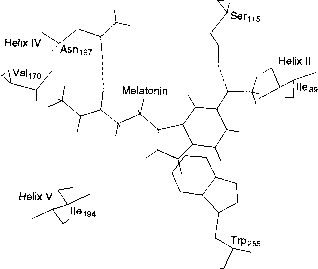 FIGURE 9-16 Human disease states related to vitamin D.
principal daughter metabolites la,25(OH)2D3 and 24,25(OH)2D3; (3) conditions that may be due to variations in organ responsiveness to these dihydroxylated metabolites; and (4) perturbations in the integrated interactions of these metabolites with PTH and calcitonin. Figure 9-16 presents a schematic diagram of the relationship between human disease states related to vitamin D and the metabolic processing of vitamin D via its endocrine system. A wide variety of organs have diseases related to vitamin D: the intestine (malabsorption), the parathyroid gland (hyper- and hypoparathyroidism), the bone (osteomalacia, osteoporosis, rickets), or the kidney, such as chronic renal failure. All of these, in their own way, reflect a disturbance in or a malfunction of the body's normal endocrine processing of vitamin D and its interaction with the other calcemic hormones. The classic deficiency state resulting from a dietary absence of vitamin D or lack of ultraviolet (sunlight) exposure is the bone disease called rickets in children or osteomalacia in adults. Historically, the identification of rickets as a disease state allowed G. Mellanby in 1920 to induce rickets in puppies experimentally by nutritionally withholding vitamin D. This work demonstrated that, in the absence of sunlight, vitamin D was truly a trace essential dietary constituent (e.g., a vitamin). The clinical features of rickets and osteomalacia depend upon the age of onset. 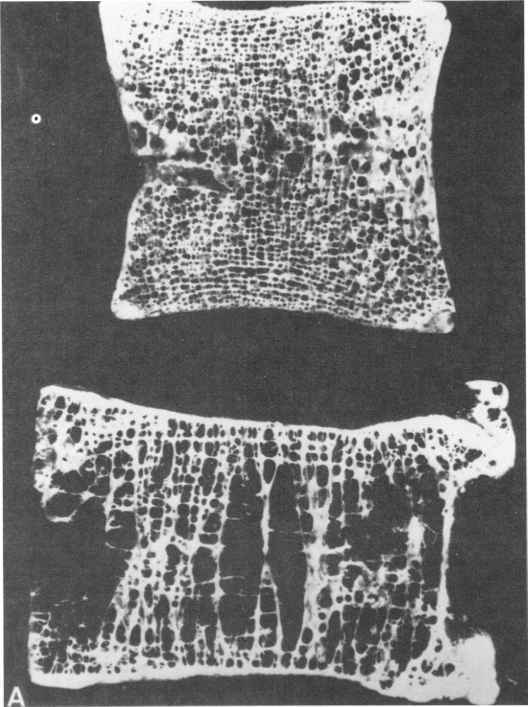 The classical skeletal disorders of rickets include deformity of the bones, especially in the knees, wrists, and ankles (see Figure 917), as well as associated changes in the costochondrial joint junctions, which have been termed by some as the rachitic rosary. If rickets develops in the first 6 mo. 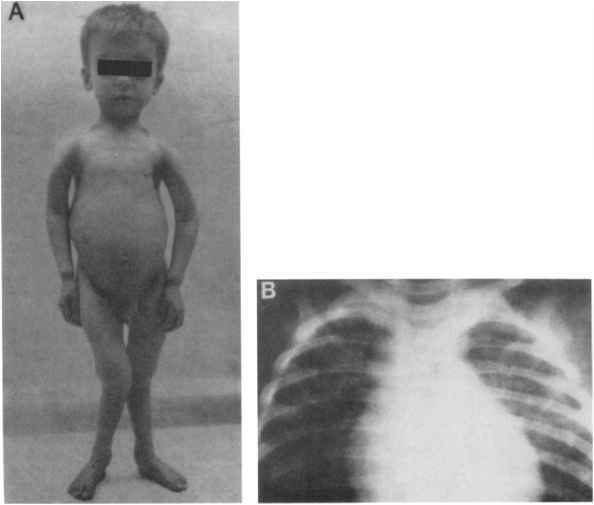 FIGURE 9-17 Classic appearance of rickets in a child. Reproduced by permission from Norman, A. W. (1979). "Vitamin D: The Calcium Homeostatic Steroid Hormone," p. 442. Academic Press, New York. (i.e., the adult stage of life), its main symptoms are muscular weakness and bone pain, with little bone deformity. A characteristic feature of bone osteomalacia and rickets is the failure of the organic matrix of bone (osteoid) to calcify. This leads to the appearance of excessive quantities of uncalcified bone matrix, termed the osteoid. In addition, there is often a high serum level of alkaline phosphatase, a fact that is often used to assist in the clinical diagnosis of the presence of osteomalacia. Osteoporosis is the most common generalized disorder of bone; it is estimated that in the United States over 25 million people, 80% of whom are female, have some form of osteoporosis. It is most simply characterized as a state of insufficiently calcified bone and is the end result of a number of metabolic abnormalities that affect the skeleton. Some of the causes of osteoporosis that have been recognized or proposed include (1) adrenal cortical hyperfunction, (2) prolonged dietary calcium deficiency, (3) reduced levels of estrogen, as in postmenopausal women, (4) prolonged skeletal immobilization, and (5) chronic vitamin D deficiency. As a consequence of these "changes," an imbalance results in the remodeling rate of bone, such that there is either an increase in the relative rate of bone resorption or a decrease in the rate of bone formation. The chief clinical sign of osteoporosis is thinning of the bones with a concomitant increase in the number of fractures (see Figure 9-18). Each year, this disease leads to more than 1.3 million fractures, mostly of the hip, spine, and wrist; more than 250,000 osteoporosis-related hip fractures occur annually. In the 1990s it is estimated that «=$5 billion will be expended annually to provide health care for hip fractures attributable to postmenopausal osteoporosis. Bilezikian, J. P., Raisz, L. G., and Rodan, G. A., eds (1996). "Principles of Bone Biology." Academic Press, San Diego. Coe, F. L., and Favus, M. J., eds. (1992). "Disorders of Bone and Mineral Metabolism." Raven Press, New York. Bouillon, R., Okamura, W. H., and Norman, A. W. (1995). Structure-function relationships in the vitamin D endocrine system Endocrine Rev. 16, 200-257. Hannah, S. S., and Norman, A. W. (1994). la,25(OH)2 Vitamin D3 regulated expression of the eukaryotic genome. Nutr. Rev. 52 (11), 376-381. Haussler, M. R., Mangelsdorf, D. J., Komm, B. S., et al. (1988). Molecular biology of the vitamin D hormone. In "Recent Progress in Hormone Research" (R. P. Greep, ed. ), pp. 263-305. Academic Press, New York. Pike, J. W. (1991). Vitamin D3 receptors: structure and function in transcription. Annu. Rev. Nutr. 11, 189-216. Suda, T„ Shinki, T., and Takahashi, N. (1990). The role of vitamin D in bone and intestinal cell differentiation. Annu. Rev. Nutr. 10, 195-211. Suda, T., Takahashi, N„ and Martin, T. J. (1992). Modulation of osteoclasat differentiation. Encocrine Rev. 13, 66-80. Vortkamp, A., Lee, K., Lanske, B., Segre, G. V., Kronenberg, H. M. and Tabin, C. J. (1996). Regulation of rate of cartilage differentiation by indian hedgehog and PTH-related protein. Science 273, 613-622. Walters, M. R. (1992). Newly identified actions of the vitamin D endocrine system. Endocrine Rev. 13, 719-764. Bringhurst, F. R., Juppner, H., Gus, J., Potts, J. T., Jr., Kronenberg, H. M„ Abou-Samra, A. B„ and Segre, G. V. (1993). Clonal, stably expressed PTH/PTHrP receptors activate multiple messenger signals and biological responses in LLC-PKI kidney cells. Endocrinology 132, 2090-2098. Ferguson, J. E., Gorman, J. V., Bruns, D. E., Weir, E. C., Burtis, W. J., Martin, T. J., and Bruns, M. E. (1992). Abundant expression of PTHrP in human amnion and its association with labor. Proc. Natl. Acad. Sci. USA 89, 8384-8385. Frost, H. M. (1990). Skeletal structural adaptations to mechanical usage—redefining Wolff's law: the bone remodeling problem. Anat. Rec. 226, 403-413 and 414-422. Holick, M. F., MacLaughlin, J. A., and Doppelt, S. H. (1981). Regulation of cutaneous previtamin D photosynthesis in man: skin pigment is not an essential regulator. Science 211, 590-593. Juppner, H., Abou-Samra, A. B., Freeman, M., Kong, X. F., Schipani, E., Richards, J., Kolakowski, L. F„ Jr., Hock, J., Potts, J. T., Jr., Kronenberg, H. M., and Segre, G. V. (1991). A G protein-linked receptor for parathyroid hormone and parathyroid hormone-related peptide. Science 254, 1024-1026. Lanske, B., Karaplis, A. C, Fee, K. et al. (1996). PTH/PTHrP receptor in early development and indian hedgehog-related bone growth Science 273, 663-666. Nemere, I., Dormanen, M. C., Hammond, M. W., Okamura, W. H., and Norman, A. W. (1994). Identification of a specific binding protein for la,25-dihydroxyvitamin D3 in basal lateral membranes of chick intestinal epithelium and relationship to transcal-tachia. J. Biol. Chem. 269 (38), 23750-23756. Norman, A. W., Bouillon, R., Farach-Carson, M. C., Bishop, J. E., Zhou, L.-X., Nemere, I., Zhao, J., Muralidharan, K. R., and Okamura, W. H. (1993a). Demonstration that 1/3,25-dihydroxyvita-min D3 is an antagonist of the nongenomic but not genomic biological responses and biological profile of the three A-ring diastereoisomers of la,25-dihydroxyvitamin D3. /. Biol. Chem. 268 (27), 20022-20030.
mic but not genomic biological responses ]. Biol. Chem. 268 (19), 13811-13819. Rhoten, W. G., and Sergeev, I. N. (1994). Calbindin-D appears to buffer intracellular Ca2+ in a butyrate-treated rat insulinoma cell line. Endocrine 2, 989-995. Tian, X. Q., Chen, T. C., Matsuoka, L. Y., Wortsman, J., and Holick, M. F. (1993). Kinetic and thermodynamic studies of the conver sion of previtamin D3 to vitamin D3 in human skin. J. Biol. Chem. 268, 14888-14892. Yamin, M., Gorn, A. H., Flannery, M. R., Jenkins, N. A., Gilbert, D. J., Copeland, N. G., Tapp, D., Krane, S. M., and Goldring, S. R. (1994). Cloning and characterization of a mouse brain calcitonin receptor cDNA and mapping of the calcitonin receptor gene. Endocrinology 135, 2635-2643.